and what training equipment is (and is not!) appropriate. 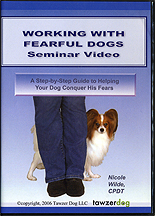 Video footage includes fearful dogs in group classes and in homes, and techniques that can be used to treat fears such as those of one specific family member, and of being handled. Interactive exercises include participation in solving a fear-related case history. You will also get an overview of how complementary therapies can make treatment plans even more successful. 3-disc set. Running Time: 5 hours, 50 minutes. Note: Although this seminar was presented to an audience of primarily trainers, it is also invaluable for owners, rescue and shelter workers, vet techs, and anyone who works with fearful dogs.